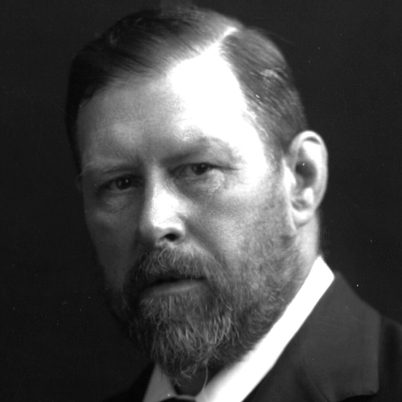 Bram Stoker wrote the grandpa of all vampire books. 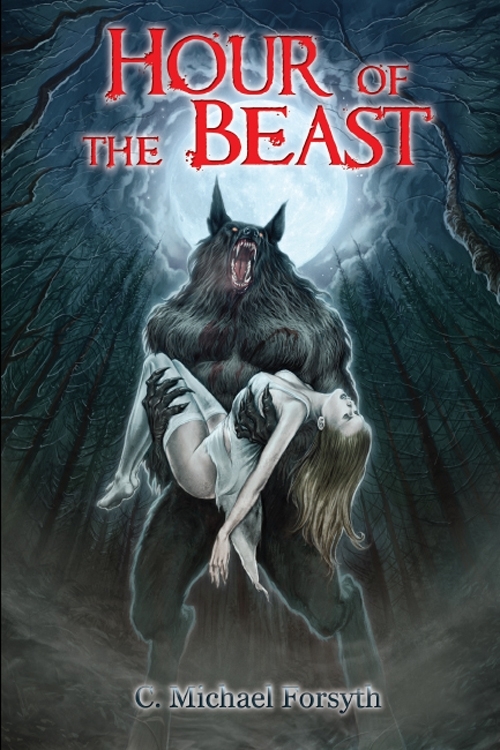 Bram Stoker’s kinsman reclaims the famous character in this gripping sequel. The story of Dracula ends with the blood-drinking fiend destroyed and newlyweds Jonathan and Mina Harker living happily ever after. Or does it? 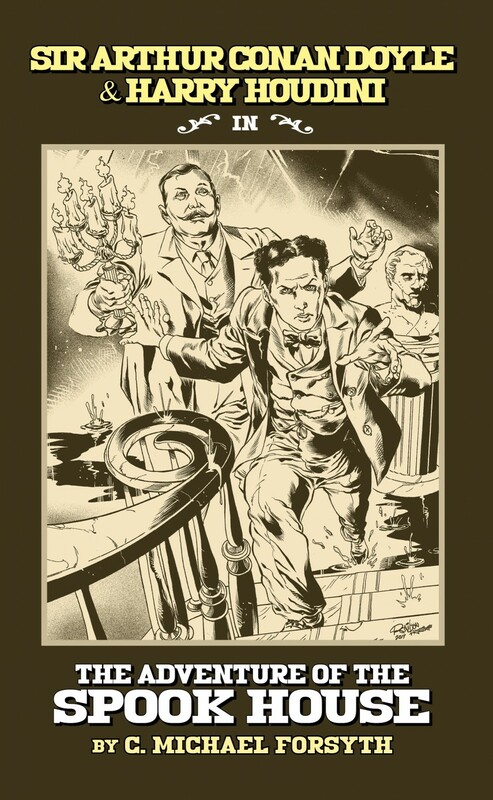 In the book Dracula the Un-Dead, an exciting sequel to Bram Stoker’s classic written by the author’s great-grandnephew Dacre Stoker, the tale of terror continues to unfold. I had the good fortune to run into Dacre at the Horror Writer’s Association’s Bram Stoker Weekend, an annual gathering that pays tribute to his famous forebear. A courtly resident of South Carolina, he was quite generous with his time. After his presentation on Bram, we chatted about the extensive research that went into the novel. We traded books, and I’ve finally had a chance to sink my teeth into this juicy vampire yarn. The book is set in 1912, about 25 years after the events in Dracula, and the band of heroes who put the vampire down are in a sorry state. Jonathan Harker, once a paragon of Victorian virtue, has been reduced to a whoring, alcoholic wretch. He’s tortured by his inability to sexually satisfy his wife the way that her superhuman “dark prince” could. Mina, forever tainted by her sip of Dracula’s blood, remains eternally young like Dorian Gray. Guilt-ridden, she counts her youthful appearance as a curse, not a blessing. Dr. Van Helsing, the wise and fearless vampire killer, is now a frail, vulnerable old man terrified of death. Dr. Seward, once the esteemed head of the asylum that housed Dracula’s bug-eating flunky Renfield, is himself a drug-addicted lunatic. 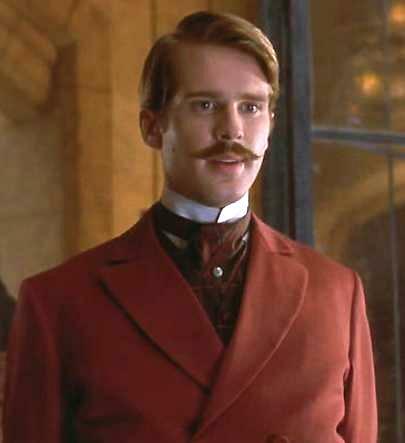 Aristocratic Arthur Holmwood, who was forced to stake his fiancée Lucy, is a bitter recluse who blames his former friends for her fate and is driven by a death wish. New characters are introduced, most prominently Elizabeth Bathory, a real-life relative of Vlad the Impaler, the historical Dracula. The 16th Century noblewoman was the most prolific serial killer in history, making dudes like Jack the Ripper and Ted Bundy look like pikers. The Bloody Countess tortured and killed at least 650 servant girls, bathing in their blood in a quest for immortality. Here, she too is a vampire – and a far more vicious one than the gentlemanly Count Dracula. 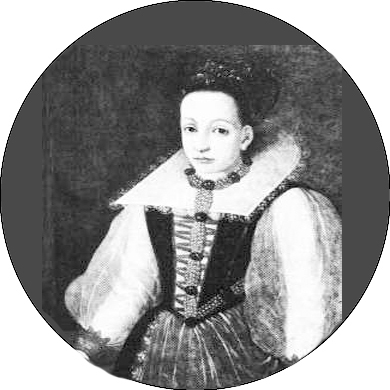 BLOODY COUNTESS: Elizabeth Bathory slaughtered at least 650 young maidens — for their blood. Also taking the stage is Basarab, a handsome and charismatic actor who is Bathory’s hated foe. Details from the original are cleverly woven into the novel and supporting characters like Renfield and Seward are fleshed out with interesting backstories. Arthur Holmwood, usually little more than an uptight prig in movies, is a fully realized character who’s led a colorful life of adventure. Even Quincy Morris, the Texan who almost never makes the cut in film versions, is given his due. Usually just an upper-crust square (as played here by Cary Elwes) Lucy’s fiance Arthur emerges as a swashbuckling hero. Dacre and his co-author Ian Holt, in addition to having access to family lore, dug deep into original sources to find nuggets that enrich the sequel. Dacre traveled to the Rosenbach Museum to comb through Bram Stoker’s notes. Among the fascinating tidbits he uncovered was the character sketch for a detective Bram toyed with including in Dracula but ultimately abandoned. Dacre resurrects Inspector Cotford in the sequel. Equally painstaking research into early 20th Century London is evident in the authoritative descriptions of locations such as the Lyceum Theater that bring the setting vividly to life. Real people of the time show up, including boozing stage legend John Barrymore — and, surprisingly, Bram Stoker himself! TOO WISE TO LIVE? 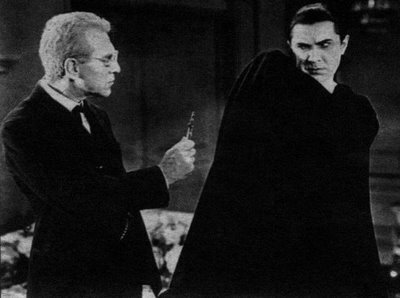 Dr. Van Helsing (Everett Sloane) had the will power to resist Dracula in the 1931 Bela Lugosi movie. MR. NICE GUY? Dracula (portrayed by Gary Oldman in “Bram Stoker’s Dracula”) saw himself as a romantic hero misunderstood by medding male mortals. 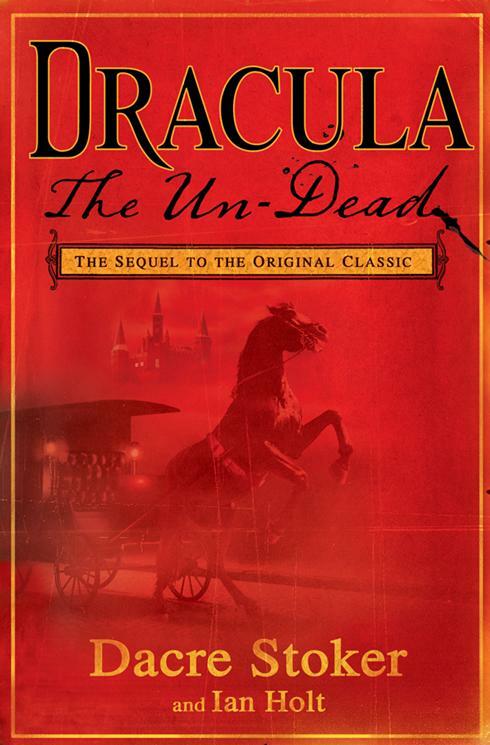 In turning the Victorian worldview upside down Dracula the Un-Dead is likely quite different from the sequel Bram Stoker would have written. But who cares? Do we really need another follow-up to Dracula that carries forward the plot on its trajectory in an easily anticipated way? We’ve already seen movies and comics in which Mina’s son Quincy Harker is an elderly hero waging a crusade against the undead. Here instead Quincy is a naïve young aspiring actor who puts his dreams of stage success above all else and fawns over his idol Basarab. (Quincy is so clueless he makes Jimmy Olsen look like Albert Einstein). That’s only the first of many surprises the book offers. 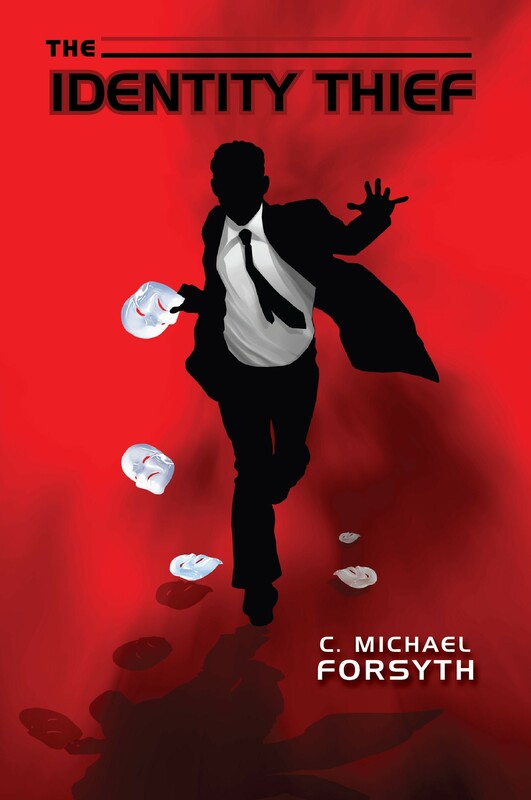 Co-author Holt is a screenwriter and the fast-paced, action-packed novel is perfectly suited for a movie adaptation. 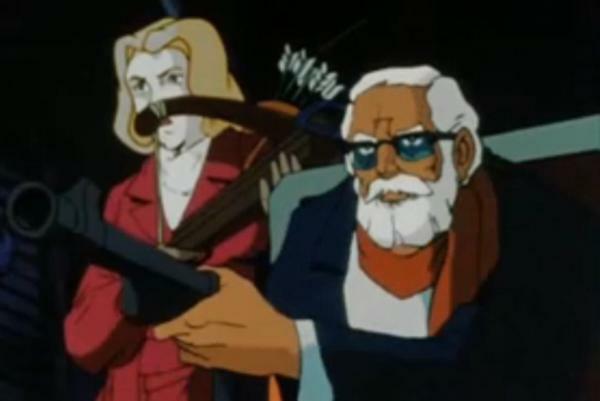 IN PAST follow-ups in comic books and movies, Quincy Harker is often a gutsy old vampire slayer. I asked Dacre whether the Stoker clan was still living off “all the Dracula money.” He gave a wistful smile and said no. Sadly, he explained, the family lost the U.S. copyright to Dracula through a clerical error early on and it’s been in the public domain ever since. 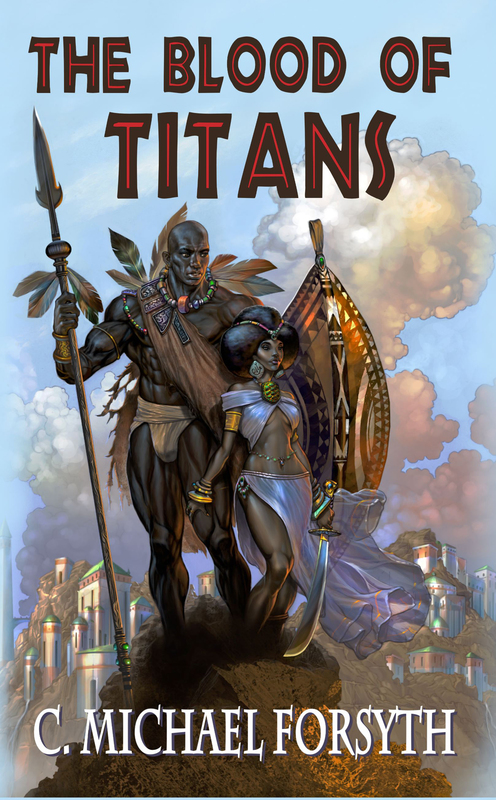 They haven’t been paid a dime by Hollywood since the 1931 Bela Lugosi movie and unlike the kin of Tarzan creator Edgar Rice Burroughs, have had no control over the wildy popular character and his many — often embarrassingly stupid — incarnations. 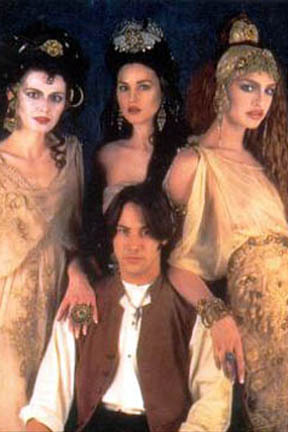 One of Dacre’s goals was to reclaim Dracula for his family. “I think Bram would be proud that a family member has taken this initiative and finally done justice to the legacy he created,” he writes in the afterward. 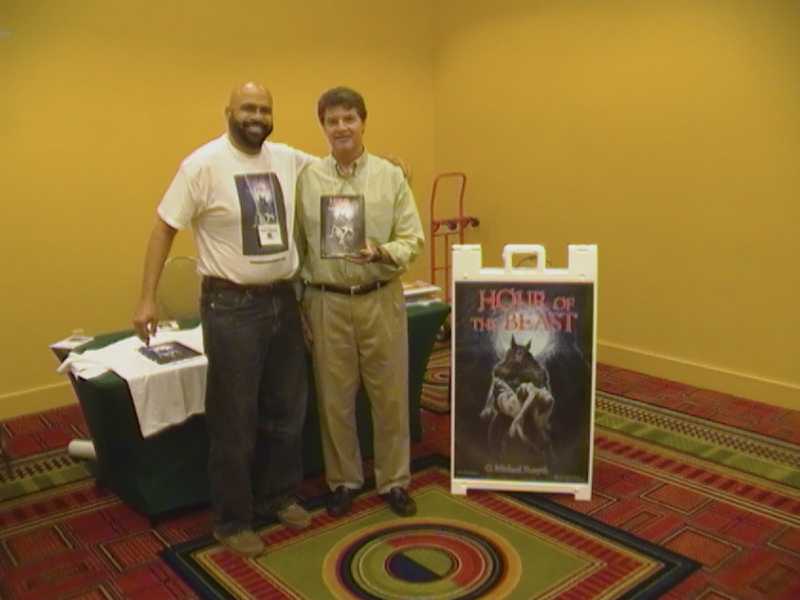 IN THE BLOOD: Dacre Stoker, great-grandnephew of Bram Stoker with C. Michael Forsyth, author of Hour of the Beast, at the Horror Writers Association convention.